Switzerland is a beautiful country and well worth the trip. 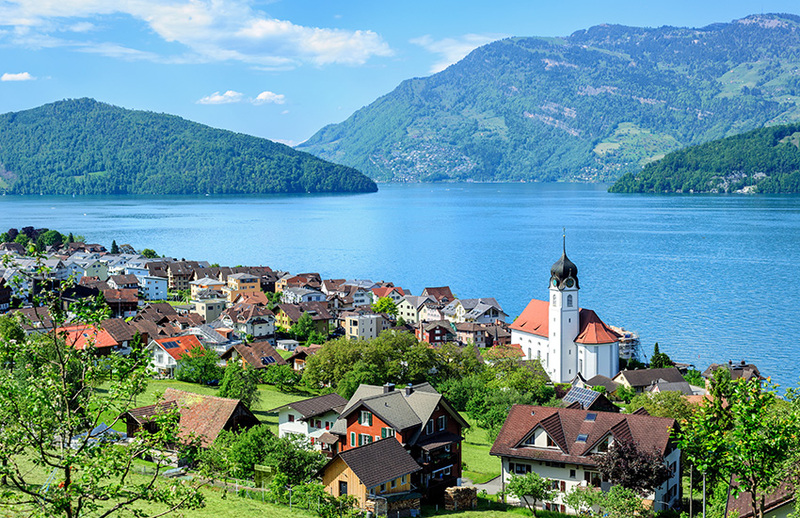 Our recommended holiday takes you across the border in to Switzerland and to Lake Lucerne. Here you will find the beauty of the lake and the mountains, it will bring to life what you imagine Switzerland to be like. The weather in this area is not generally really hot, it suits people who like more comfortable temperatures, not necessarily basking in the sun. During the summer months the temperatures tend to get in to the mid 20’s. July is usually the hottest month although also the wettest. June to September is peak season with generally pleasant weather, although the proximity to the Alps does keep the temperature cool. Particularly in the evenings. From November to mid April it is ski season and people visit Lake Lucerne for winter activities in the mountains. The temperatures stay minus until March when the temperature, although still cold starts to rtise gradually through to May. The best time to visit Lucerne therefore depends on what you plan to do whilst you are there. The information above should help you make your choice. Summarising the previous paragraph, it depends on what you are planning to do. If you like the pleasant warmer weather you should visitbetween June-September. If it’s winter sports that take your fancy then try visiting between November and mid-April. The driest month is January. The route that we would recommend from the UK would be the Eurotunnel from Folkestone to Calais. We prefer this way to cross the channel as it’s by far the quickest and easiest. From boarding in England to exiting in France you are looking at around 40 minutes in total. Some people prefer to catch a ferry. This route takes slightly longer but because of that it does give you time away from driving and staying with your vehicle. The ferry is a good option if you would like the opportunity to stretch your legs, have a meal, and enjoy the facilities on board a ferry. It’s your decision. There are three routes to choose from to get to Lake Lucerne. They are all slightly variedin distance but will take approximately the same time in hours give or take an hour or so. As you are travelling a fair distance from the UK the best way to think of these routes is as part of your holiday. Don’t just think of them as a means to get there and back, incorporate them as part of the experience. This makes the journey there and back more enjoyable. Consider Lake Lucerne to be one of your stops on your motorhome tour. That’s why it’s a good idea to choose your route not just with distance in mind but also thinking what you want to do and see. Lucerne is Fairy Tale City, complete with a glacial lake, covered bridges, church spires….. and of course the Swiss Alps. It is a pristine Swiss lake with sparkling blue water and surrounding snow-capped mountains. Enjoy a cruise on the paddle steamer Schiller constructed in 1906. A great way to appreciate the size of the lake. A trip to Lucerne isn’t complete without seeing the Lion of Lucerne. The Lion of Lucerne commemorates the Swiss Guards who were massacred in 1792 during the French Revolution when revolutionaries stormed the Tuileries Palace in Paris. Visit Mount Pilatus which overlooks Lake Lucerne and ride the steepest cogwheel railway in the world with a gradient of up to 48%. The trip takes about 30 minutes travel time from the base at Alpnachstad to the Pilatus Kulm, passing alpine meadows and striking rock formations.